Happy Monday! We have a fresh new recipe to get your week off to a fabulous start. Nothing adds a ray of sunshine to your day and awakens your senses like lemon. The crisp, citrusy aroma of lemon is seriously hard to beat. And if you’re like me and crazy for mini’s… mini cakes, mini cupcakes, mini desserts of all kinds. Then today’s recipe is a double win! It’s cheerful, bright and just down right fun. Adorable and delectable. 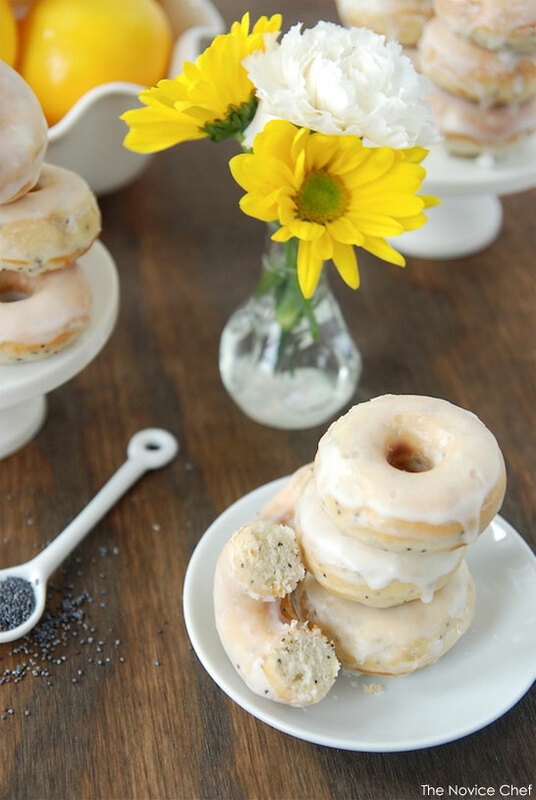 You’re going to love these Lemon Poppy Seed Mini Donuts! Shared with us by Jessica Segarra of The Novice Chef Blog from her new book, Mini Donuts: 100 Bite-Sized Donut Recipes to Sweeten Your “Hole” Day. STEP 1: If using an electric donut maker, preheat according to manufacturer’s instructions. If using donut pans, preheat oven to 350°F and grease donut pans. STEP 2: In a small bowl, whisk together milk and sour cream. Set aside. In a separate small bowl, whisk together flour, baking powder, and salt. Set aside. STEP 3: In a large bowl or a stand mixer, cream together butter and sugar until light and fluffy— about 1 minute. Add egg, lemon zest, and poppy seeds. Beat for 30 seconds, scrapping down the bowl as needed. STEP 4: Then, alternating flour mixture and milk mixture, combine all ingredients until just blended. Transfer batter to a piping bag, or to a Ziploc bag with the tip cut off. STEP 5: If using mini-donut pans: Carefully fill each donut indentation ¾ full. Bake for 7–9 minutes or until a toothpick inserted into a donut comes out clean. Transfer donuts to a cooling rack and cool completely. If using an electric mini-donut maker: Carefully fill each donut indentation ¾ full. Bake according to manufacturer’s instructions or until a toothpick inserted into a donut comes out clean. Remove donuts from appliance, transfer to a cooling rack, and let cool completely. STEP 6: Place wax paper under a wire rack to collect any drippings for an easy cleanup. Then, in a small bowl, whisk together lemon juice and powdered sugar until smooth. STEP 7: Dip the top of each donut into the icing, transfer to a wire rack, and let set for 5 minutes. Serve immediately; donuts can be stored in an airtight container for up to 3 days but are best served fresh. Double Dip: While it’s not okay at parties, when you’re icing donuts, it is totally acceptable to double dip. If you are a big fan of lemon, circle back around after your first donut dip . . . and dip them again! Just allow a little extra time, about 5 minutes, for the icing to set up after your second dip.